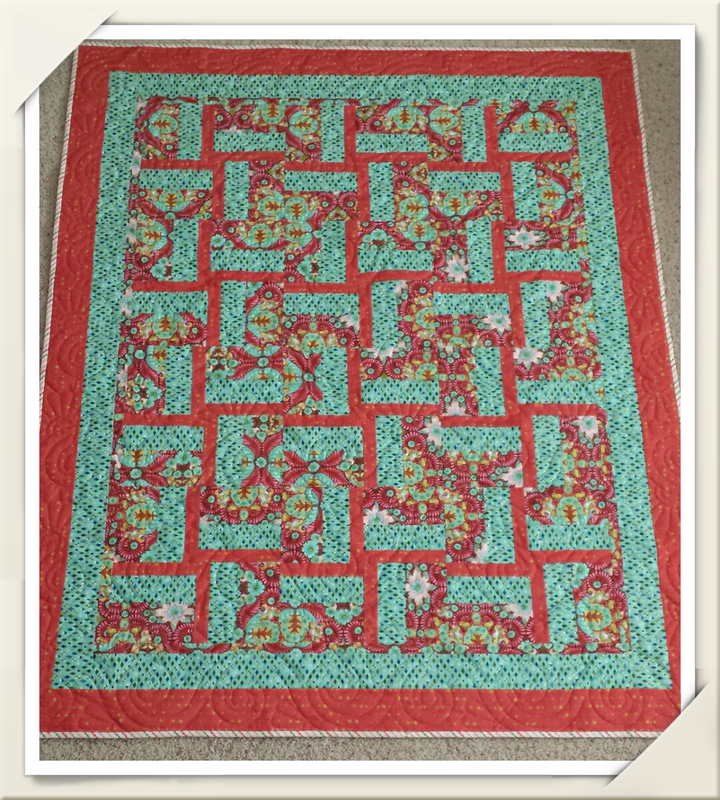 June was a good month for binding quilts. Don't ask me why because usually the winter months are best for curling up in my chair with a quilt on my lap and a few movies or a good audio book to entertain me while stitching away. The flowers peeking out here and there remind me of my neighbor's passion flower vine. We love the beautiful flowers but the roots of the plant are invasive and the plant came up in her garage and other unlikely places. 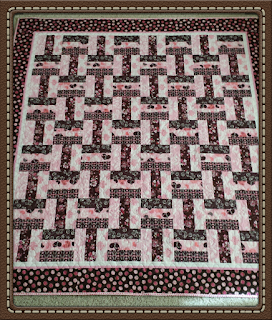 The second quilt to the finish line was a long time in the queue. I started this quilt in Walla Walla and it was waiting for me to do the borders when we decided to pack up the HandiQuilter for our great move to the WE(s)T side of the state. It was my intent to freehand vining flowers and leaves in the last border but instead the borders offered an opportunity to practice placing computerized patterns. For a first try, I am satisfied even though the program with my new machine doesn't self correct if the borders are not totally straight. But if I had tried the same pattern freehand in the first and second borders, they wouldn't be any better and maybe worse. My freehanding skills are limited to a few meandering E2E designs. 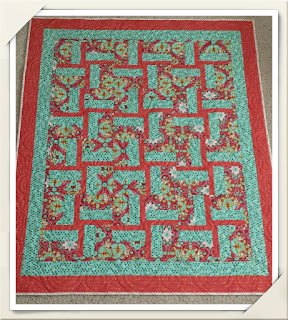 This one has loops, leaves, and flowers that were inspired by the fabric prints. a collection of fabrics in the same colors from my stash. 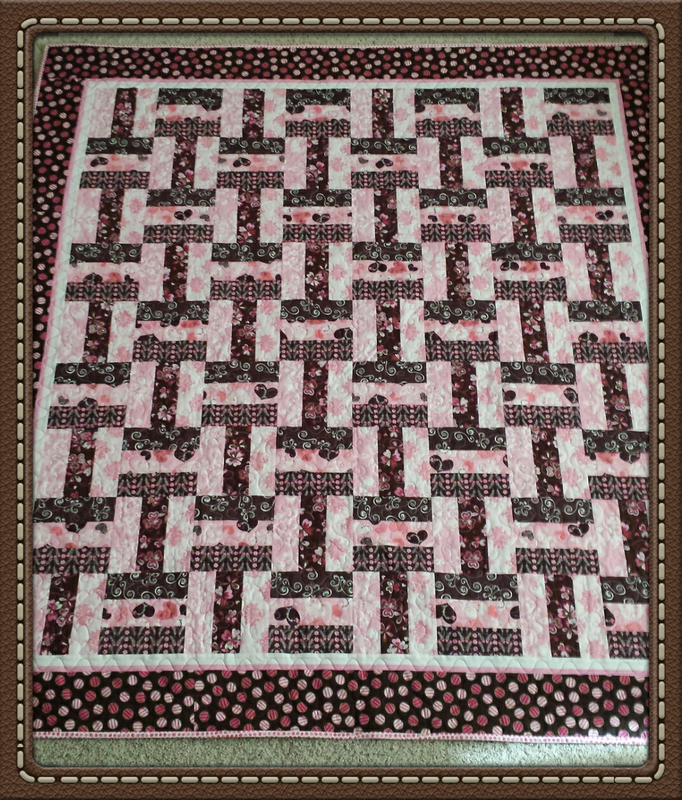 This quilt is a Cozy Quilts pattern. 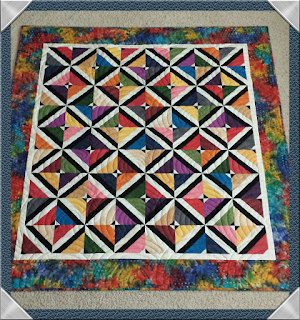 The piecing method looks time consuming and tedious but only involves making strips sets of a colorful fabric framed by a white and black strip. For the first time since I started making quilts in the '70's, I chose to cut continuous borders. 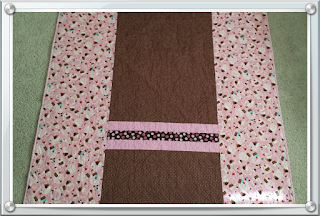 The rainbow batik in the outside border just didn't look as nice pieced so not only do I have the other half of the jelly roll left but I have just enough for the borders and binding, too. But don't get me wrong, batiks don't offer much give so don't even consider cutting the binding on the lengthwise grain. I don't recommend it for another important reason. The strongest threads run lengthwise and the weakest are crosswise. A lengthwise fold will cut across the weakest threads and they will more easily fray. The longest wearing binding is bias cut and with a stripe that runs lenghtwise or crosswise on the fabric, it definitely adds a special finishing touch. 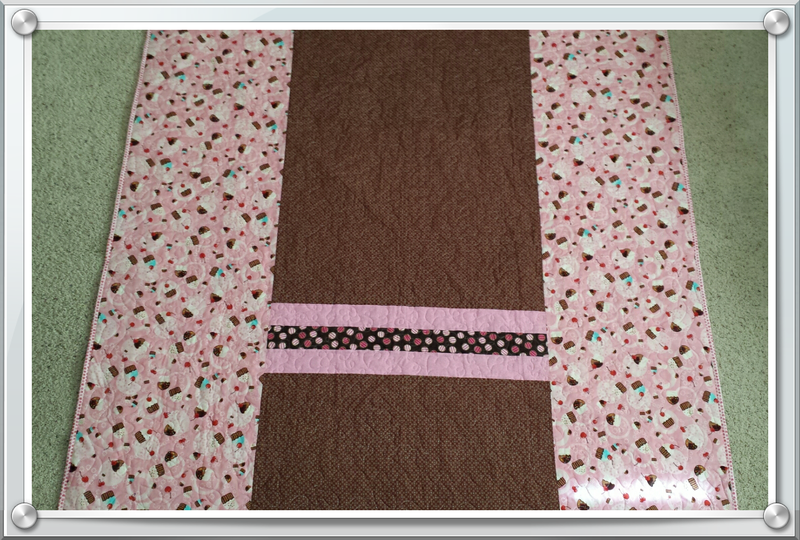 The binding for June OMG was quickly cut on the bias using a GO cutter. Just 17 inches of fabric and a simple folding technique produced just the right amount of strips. I really like that bottom quilt, too. Thanks, Cheryl! 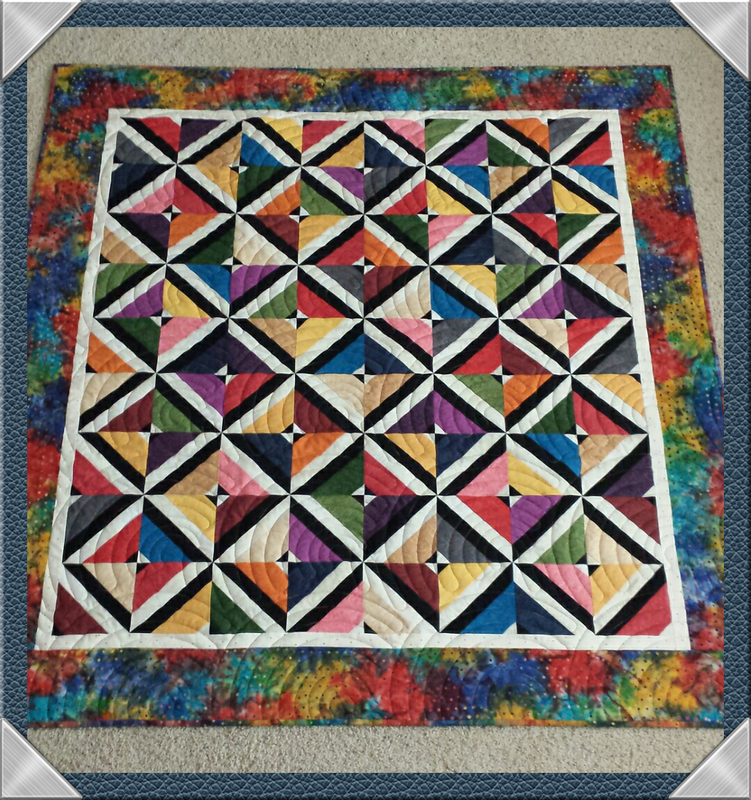 The bright clear colors and clean lines are eye catching, but I am happy my neighbor likes the first quilt. It is always a pleasure to have ones time and effort appreciated.